Share this article on Facebook. FTM is giving away 15 FREE "More Cowbell" Sandwiches. A sandwich created by FTM Family member, City Barbeque, has been named one of the best sandwiches in the nation according to Restaurant Hospitality magazine’s new ranking. City Barbeque’s “More Cowbell” sandwich was once of six sandwiches recognized as America’s best in the beef category. 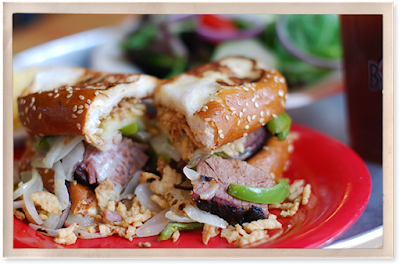 Launched last year, the "More Cowbell" sandwich is smoked beef brisket topped with melted provolone cheese, grilled peppers, sautéed onions, onion straws and horseradish sauce. The kicker? It sits on top of two pieces of garlic-buttered Texas toast. “Cincinnati and Northern Kentucky are well known for their delicious food scene, there are tons of great choices out there. We are excited that our More Cowbell has been added to the list. It really has created a very loyal following with BBQ fans all over the area begging for More Cowbell! It’s fun, unique and the perfect combination of texture and flavor,” said Leda Isenhour, City Barbeque Marketing Manager. The winners were determined based on nominations from restaurateurs and chefs across the country, customer reviews and secret taste tests. "This year's Best Sandwiches in America Contest was insane with so many entries. That was particularly true in the beef category, which attracted a lot more attention than many of the other categories," said Michael Sanson, editor-in-chief of Restaurant Hospitality magazine. "We were blown away by City Barbeque's More Cowbell (hilarious name). The brisket sandwich was a complex, delicious, sloppy mess! We want another!" City Barbeque has five locations and headquartered in Dublin, Ohio. Locally, there are located in Highland Heights next to Ft. Thomas Jewelers.